"Extending Food Safety down the Supply Chain:Incorporating Suppliers"
How can you best manage food safety across the global supply chain while ensuring regulatory compliance? With this, comes the challenge of being able to ensure that all entities within the supply chain meet their responsibility for food safety and quality. 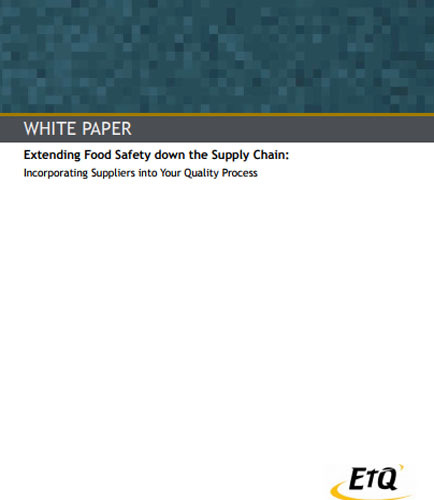 This whitepaper on “Extending Food Safety down the Supply Chain,” outlines several key concepts into how companies can extend their enterprise Food Safety Management System (FSMS) to their suppliers, and effectively take quality outside their four walls. Read this whitepaper that describes background information of food safety regulations as well as action steps that can be taken to mitigate the inherent risks of a global food supply chain. Four Steps to Building a Global Supply Chain Risk Management Platform Managing global supply chain risk is difficult, as these risks range from the minor "bump" in the road to a company disaster. With the right proactive approach these risks can be mitigated and even eliminated. Do you want to identify and understand the possible causes, and direct and indirect effects of these risks? Read this whitepaper which represents the 'four cornerstones for impementing successful supply chain risk management process '' as well as addresses a few questions like: Which are the steps needed in building a global supply chain risk management platform? What are the common issues and challenges that exists in global supply chain management process? How are environmental factors affecting global supply chain risk management? How to prevent risk in global supply chain management process? How to improve supply chain risk management by monitoring for risks to your global supply chain process? The whitepaper also comes with a case study for Financial Solvency Verification.